You will select your transportation or parking option on your registration form. We recommend reviewing the options below before beginning the registration process. PLEASE NOTE: We are providing buses between the RiverCentre and the Capitol in the middle of the day. At 4:00 pm, when everything is completed at the Capitol, buses will pick people up from the Capitol, in the same general area they were dropped off (along Martin Luther King Blvd., south, and east of the Capitol). All buses will be marked with signs in their windows noting the location to which they are returning. We are working with dioceses to create diocesan-sponsored busing opportunities from Greater Minnesota. If a bus is scheduled but then does not have a sufficient number of riders, it is subject to cancellation. In the event that you have registered, and the bus you had planned on taking is canceled, we will not refund registration, as there will still be diocesan-sponsored busing from each diocese. After you have registered, your diocesan liaison will be in touch with those who registered for the diocesan-sponsored transportation option. Times and locations for each diocese are listed below as we receive the details. Your diocesan liaison will provide you with any updates. ***NOTE*** This is a bus sign up only. To register for the Catholics at the Capitol event, please click here. For those who live in the Archdiocese (or in an outstate diocese near a park-and-ride location) you may want to consider one of the following park-and-ride options instead of driving to downtown St. Paul to find parking (most of which is not free). After you register you will receive a follow-up email with details on the time and location of departure. A bus from each location will bring you to RiverCentre. Please note that you will have to walk from Assumption to the RiverCentre after Mass – no transportation provided. A group will be departing from Assumption together. You are welcome to arrive at RiverCentre by your own means of transportation. You will be expected to find your own parking. Below are two locations we suggest. RiverCentre parking ramp – 150 W Kellogg Blvd, St Paul, MN 55102. Please note that this is a public pay lot. 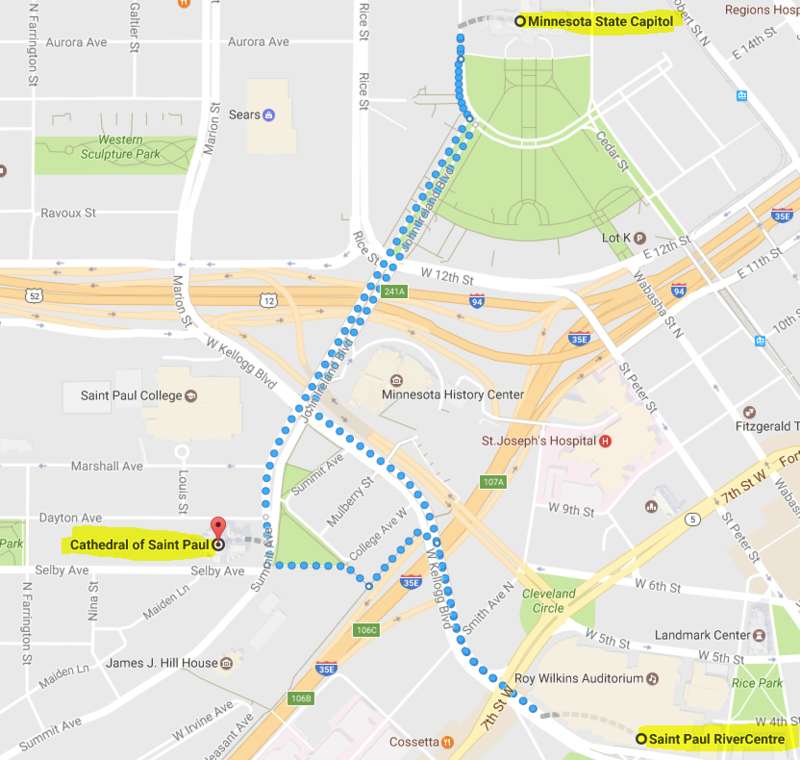 Cathedral of Saint Paul visitor lot – 239 Selby Ave, St Paul, MN 55102 You may park for free at the Cathedral and walk to the RiverCentre. See map below.